As the story goes, God decided to hold a banquet and invited all of the animals to attend. The rat, mischievious as he was, told his neighbour the cat that the banquet was the day after the banquet and the cat trusted his word. When it was time to attend the banquet, the rat rode upon the back of the ox and leaped off so that he would be the first on there. The other animals followed and together, they feasted until morning…. all except the cat, who had been tricked into not attending. This is the story that Kyoko tells Tohru when she is a little girl. Tohru felt so bad for the cat being left out that she decided that she wanted to be born in the year of the cat rather than the dog. 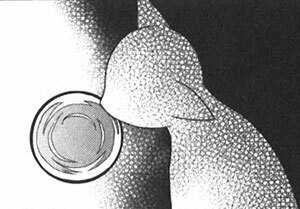 When discovers that the Sohma family is possessed by the spirits of the animals from the story, she's ecstatic to hear that the cat is represented. 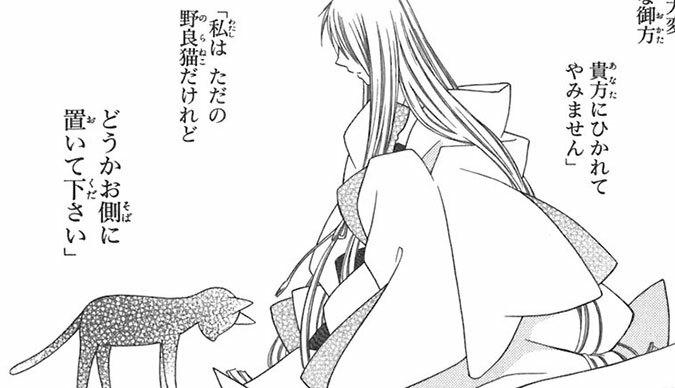 When she meets Kyo, she tells him that she always wanted to be a cat, which needless to say, catches him off guard. It isn't until the end of the series that we are told how the curse of possession came to be. God was a long-lived man who couldn't get along with other people because he was different and he was afraid of getting hurt. He chose to live in solidarity. One day, a cat appears at the man's doorstep and says he has been drawn in by the man's interesting aura, asking if he might stay by his side. The man agreed and the cat never left his side, not even once. As time passed, the man decided that maybe he would be able to make friends with other animals. He wrote many invitations for a grand banquet and sent them out to all the animals. Twelve showed up and together they would have a wonderful banquet every night under the moon with god and the cat. Eventually, the cat became ill and god became devastated at the thought of losing him. Together, he and the other animals cried and realised that their banquet would eventually end because they all must die at some point. God had an idea: he took a bowl of water and drew his finger in a circle upon the water's surface. He made the cat take a sip and told the other animals that if they also drink from the bowl, they will be reborn time after time and they would all be able to have a banquet together for eternity. The animals willingly drank from the bowl but the cat asked god why he was made to drink from it: he did not want to live for eternity. The cat told god that it was okay that he was afraid but he and the others must accept that everything must come to an end, even if it is very sad. He tells god that even if it was but for a short time, he was happy every day they spent together. The cat says that if he were to be reborn, he would rather see god smiling in the sunlight, surrounded by many people, laughing together. Those were his last words before he peacefully passed away. God was happy but the other animals no longer cared for the cat as they did not understand why he would reject eternity together. They continued their banquets until each animal died and then god himself died. They were reborn time and time again until the origin of their meeting was all but forgotten until they are released from the curse many, many years later. We don't really know why the cat is the only one out of the twelve that turns into a demon; perhaps it is because the cat never wanted eternity in the first place. 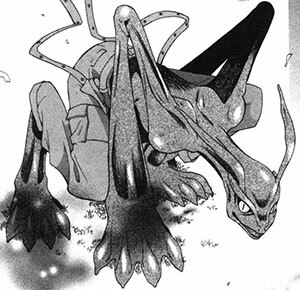 After all, the smell this form has is said to reek like something is rotting and it's so bad that Tohru cannot stand it without throwing up. Maybe this is a representation of the bad side of eternity. The dark, lonely room where the cat is to be confined for life is likely a cruel way of honoring his wish to not partake in living for eternity. The cat has become warped over the centuries of rebirths, not just in form but in representation as well. Akito says that the cat's duty is to be the worst of the lot so that the other accursed members can feel better about themselves… and this is what has happened as a result. Even various members of the zodiac admit to feeling better around Kyo because no matter how horrible their lives might be, he has it worse. There are legends in real life referring to the cat not being a part of the Chinese zodiac. The common one is the same as seen in Fruits Basket, where the rat either tricks the cat into not attending a banquet or forgets to wake the cat up. Either way, the result is that the rat is generally responsible for the cat not showing up on time and thus not receiving a year of its own in the 12-year cycle. This is usually used to explain why rats and cats don't get along. In the Vietnamese zodiac however, the cat actually does have a place in the zodiac! It's the fourth animal, replacing what would be the rabbit in the Chinese zodiac.